Minocycline Hydrochloride with NDC 0378-4293 is a a human prescription drug product labeled by Mylan Pharmaceuticals Inc.. The generic name of Minocycline Hydrochloride is minocycline hydrochloride. The product's dosage form is tablet, film coated, extended release and is administered via oral form. FDA Application Number: ANDA203443 What is the FDA Application Number? Minocycline hydrochloride extended-release tablets are indicated to treat only inflammatory lesions of non-nodular moderate to severe acne vulgaris in patients 12 years of age and older. Minocycline hydrochloride extended-release tablets did not demonstrate any effect on non-inflammatory acne lesions. Safety of minocycline hydrochloride extended-release tablets has not been established beyond 12 weeks of use. This formulation of minocycline has not been evaluated in the treatment of infections [see Clinical Studies (14)]. To reduce the development of drug-resistant bacteria as well as to maintain the effectiveness of other antibacterial drugs, minocycline hydrochloride extended-release tablets should be used only as indicated [see Warnings and Precautions (5.11)]. The recommended dosage of minocycline hydrochloride extended-release tablets is approximately 1 mg/kg once daily for 12 weeks. Higher doses have not shown to be of additional benefit in the treatment of inflammatory lesions of acne, and may be associated with more acute vestibular side effects. The following table shows tablet strength and body weight to achieve approximately 1 mg/kg. Table 1: Dosing Table for Minocycline Hydrochloride Extended-Release TabletsPatient’s Weight(lbs. )Patient’s Weight(kg)Tablet Strength(mg)Actual mg/kg Dose99-10945-49451-0.92110-13150-59551.10-0.93132-15760-71651.08-0.92158-18672-84801.11-0.95187-21285-96901.06-0.94213-24397-1101051.08-0.95244-276111-1251151.04-0.92277-300126-1361351.07-0.99Minocycline hydrochloride extended-release tablets may be taken with or without food [see Clinical Pharmacology (12.3)]. Ingestion of food along with minocycline hydrochloride extended-release tablets may help reduce the risk of esophageal irritation and ulceration.In patients with renal impairment, the total dosage should be decreased by either reducing the recommended individual doses and/or by extending the time intervals between doses [see Warnings and Precautions (5.4)]. •The 80 mg extended-release tablets are pink, film-coated, round, unscored tablets imprinted with MX100 in black ink on one side of the tablet and blank on the other side. •The 105 mg extended-release tablets are brown, film-coated, capsule shaped, unscored tablets imprinted with MX101 in black ink on one side of the tablet and blank on the other side. 1.MINOCYCLINE, LIKE OTHER TETRACYCLINE-CLASS DRUGS, CAN CAUSE FETAL HARM WHEN ADMINISTERED TO A PREGNANT WOMAN. IF ANY TETRACYCLINE IS USED DURING PREGNANCY OR IF THE PATIENT BECOMES PREGNANT WHILE TAKING THESE DRUGS, THE PATIENT SHOULD BE APPRISED OF THE POTENTIAL HAZARD TO THE FETUS. Minocycline hydrochloride extended-release tablets should not be used during pregnancy or by individuals of either gender who are attempting to conceive a child [see Nonclinical Toxicology (13.1) and Use in Specific Populations (8.1)]. 2.THE USE OF DRUGS OF THE TETRACYCLINE CLASS DURING TOOTH DEVELOPMENT (LAST HALF OF PREGNANCY, INFANCY, AND CHILDHOOD UP TO THE AGE OF 8 YEARS) MAY CAUSE PERMANENT DISCOLORATION OF THE TEETH (YELLOW-GRAY-BROWN). This adverse reaction is more common during long-term use of the drug but has been observed following repeated short-term courses. Enamel hypoplasia has also been reported. TETRACYCLINE DRUGS, THEREFORE, SHOULD NOT BE USED DURING TOOTH DEVELOPMENT. 3.All tetracyclines form a stable calcium complex in any bone-forming tissue. A decrease in fibula growth rate has been observed in premature human infants given oral tetracycline in doses of 25 mg/kg every 6 hours. This reaction was shown to be reversible when the drug was discontinued. Results of animal studies indicate that tetracyclines cross the placenta, are found in fetal tissues, and can cause retardation of skeletal development on the developing fetus. Evidence of embryotoxicity has been noted in animals treated early in pregnancy [see Use in Specific Populations (8.1)]. Postmarketing cases of serious liver injury, including irreversible drug-induced hepatitis and fulminant hepatic failure (sometimes fatal) have been reported with minocycline use in the treatment of acne. Cases of anaphylaxis, serious skin reactions (e.g., Stevens-Johnson syndrome), erythema multiforme, and drug rash with eosinophilia and systemic symptoms (DRESS) syndrome have been reported postmarketing with minocycline use in patients with acne. DRESS syndrome consists of cutaneous reaction (such as rash or exfoliative dermatitis), eosinophilia, and one or more of the following visceral complications such as: hepatitis, pneumonitis, nephritis, myocarditis, and pericarditis. Fever and lymphadenopathy may be present. In some cases, death has been reported. If this syndrome is recognized, the drug should be discontinued immediately. Bacterial resistance to the tetracyclines may develop in patients using minocycline hydrochloride extended-release tablets, therefore, the susceptibility of bacteria associated with infection should be considered in selecting antimicrobial therapy. Because of the potential for drug-resistant bacteria to develop during the use of minocycline hydrochloride extended-release tablets, they should be used only as indicated. Adverse reactions that have been reported with minocycline hydrochloride use in a variety of indications include: Skin and Hypersensitivity Reactions: fixed drug eruptions, balanitis, erythema multiforme, Stevens-Johnson syndrome, anaphylactoid purpura, photosensitivity, pigmentation of skin and mucous membranes, hypersensitivity reactions, angioneurotic edema, anaphylaxis, DRESS syndrome [see Warnings and Precautions (5.9)].Autoimmune Conditions: polyarthralgia, pericarditis, exacerbation of systemic lupus, pulmonary infiltrates with eosinophilia, transient lupus-like syndrome. Central Nervous System: pseudotumor cerebri, bulging fontanels in infants, decreased hearing. Endocrine: brown-black microscopic thyroid discoloration, abnormal thyroid function. Oncology: thyroid cancer. Oral: glossitis, dysphagia, tooth discoloration. Gastrointestinal: enterocolitis, pancreatitis, hepatitis, liver failure. Renal: reversible acute renal failure. Hematology: hemolytic anemia, thrombocytopenia, eosinophilia. Preliminary studies suggest that use of minocycline may have deleterious effects on human spermatogenesis [see Nonclinical Toxicology (13.1)]. In a multi-center study to evaluate the effect of minocycline hydrochloride extended-release tablets on low dose oral contraceptives, hormone levels over one menstrual cycle with and without minocycline hydrochloride extended-release tablets 1 mg/kg once-daily were measured. Based on the results of this trial, minocycline-related changes in estradiol, progestinic hormone, FSH and LH plasma levels, of breakthrough bleeding, or of contraceptive failure, cannot be ruled out. To avoid contraceptive failure, female patients are advised to use a second form of contraceptive during treatment with minocycline. [see Warnings and Precautions (5.1)].Minocycline hydrochloride extended-release tablets should not be used during pregnancy. If the patient becomes pregnant while taking this drug, the patient should be apprised of the potential hazard to the fetus and stop treatment immediately.There are no adequate and well-controlled studies on the use of minocycline in pregnant women. Minocycline, like other tetracycline-class drugs, crosses the placenta and may cause fetal harm when administered to a pregnant woman.Rare spontaneous reports of congenital anomalies including limb reduction have been reported with minocycline use in pregnancy in postmarketing experience. Only limited information is available regarding these reports; therefore, no conclusion on causal association can be established.Minocycline induced skeletal malformations (bent limb bones) in fetuses when administered to pregnant rats and rabbits in doses of 30 mg/kg/day and 100 mg/kg/day, respectively, (resulting in approximately 3 times and 2 times, respectively, the systemic exposure to minocycline observed in patients as a result of use of minocycline hydrochloride extended-release tablets). Reduced mean fetal body weight was observed in studies in which minocycline was administered to pregnant rats at a dose of 10 mg/kg/day (which resulted in approximately the same level of systemic exposure to minocycline as that observed in patients who use minocycline hydrochloride extended-release tablets).Minocycline was assessed for effects on peri- and post-natal development of rats in a study that involved oral administration to pregnant rats from day 6 of gestation through the period of lactation (postpartum day 20), at dosages of 5, 10, or 50 mg/kg/day. In this study, body weight gain was significantly reduced in pregnant females that received 50 mg/kg/day (resulting in approximately 2.5 times the systemic exposure to minocycline observed in patients as a result of use of minocycline hydrochloride extended-release tablets). No effects of treatment on the duration of the gestation period or the number of live pups born per litter were observed. Gross external anomalies observed in F1 pups (offspring of animals that received minocycline) included reduced body size, improperly rotated forelimbs, and reduced size of extremities. No effects were observed on the physical development, behavior, learning ability, or reproduction of F1 pups, and there was no effect on gross appearance of F2 pups (offspring of F1 animals). Minocycline hydrochloride extended-release tablets are indicated to treat only inflammatory lesions of non-nodular moderate to severe acne vulgaris in patients 12 years and older. Safety and effectiveness in pediatric patients below the age of 12 has not been established. Use of tetracycline-class antibiotics below the age of 8 is not recommended due to the potential for tooth discoloration [see Warnings and Precautions (5.1)]. 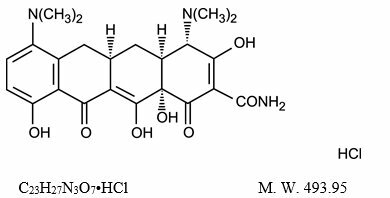 Minocycline hydrochloride, a semi synthetic derivative of tetracycline, is [4S-(4,4a,5a,12a)]-4,7-bis(Dimethylamino)-1,4,4a,5,5a,6,11,12a-octahydro-3,10,12,12a-tetrahydroxy-1,11-dioxo-2-naphthacene carboxamide monohydrochloride. The structural formula is represented below: Minocycline hydrochloride extended-release tablets, USP for oral administration contain minocycline hydrochloride, USP equivalent to 80 mg or 105 mg of minocycline. In addition, 80 mg and 105 mg tablets contain the following inactive ingredients: colloidal silicon dioxide, hypromellose, lactose monohydrate, magnesium stearate, polyethylene glycol, red iron oxide, titanium dioxide, triacetin and yellow iron oxide. The 105 mg tablets also contain black iron oxide. The imprinting ink contains ammonium hydroxide, black iron oxide, propylene glycol, and shellac glaze.FDA approved dissolution specification differs from the USP dissolution specification. Minocycline hydrochloride extended-release tablets are not bioequivalent to non-modified release minocycline products. Based on pharmacokinetic studies in healthy adults, minocycline hydrochloride extended-release tablets produce a delayed Tmax at 3.5-4.0 hours as compared to a non-modified release reference minocycline product (Tmax at 2.25-3 hours). At steady-state (Day 6), the mean AUC(0-24) and Cmax were 33.32 μg×hr/mL and 2.63 μg/mL for minocycline hydrochloride extended-release tablets and 46.35 μg×hr/mL and 2.92 μg/mL for Minocin® capsules, respectively. These parameters are based on dose adjusted to 135 mg per day for both products. A single-dose, four-way crossover study demonstrated that minocycline hydrochloride extended-release tablets used in the study (45 mg, 90 mg, 135 mg) exhibited dose-proportional pharmacokinetics. In another single-dose, five-way crossover pharmacokinetic study, minocycline hydrochloride extended-release tablets 55 mg, 80 mg, and 105 mg were shown to be dose-proportional to minocycline hydrochloride extended-release tablets 90 mg and 135 mg.When minocycline hydrochloride extended-release tablets were administered concomitantly with a meal that included dairy products, the extent and timing of absorption of minocycline did not differ from that of administration under fasting conditions. Minocycline is lipid soluble and distributes into the skin and sebum. In a carcinogenicity study in which minocycline HCl was orally administered to male and female rats once daily for up to 104 weeks at dosages up to 200 mg/kg/day, minocycline HCl was associated in both genders with follicular cell tumors of the thyroid gland, including increased incidences of adenomas, carcinomas and the combined incidence of adenomas and carcinomas in males, and adenomas and the combined incidence of adenomas and carcinomas in females. In a carcinogenicity study in which minocycline HCl was orally administered to male and female mice once daily for up to 104 weeks at dosages up to 150 mg/kg/day, exposure to minocycline HCl did not result in a significantly increased incidence of neoplasms in either males or females. Male and female reproductive performance in rats was unaffected by oral doses of minocycline of up to 300 mg/kg/day (which resulted in up to approximately 40 times the level of systemic exposure to minocycline observed in patients as a result of use of minocycline hydrochloride extended-release tablets). However, oral administration of 100 or 300 mg/kg/day of minocycline to male rats (resulting in approximately 15 to 40 times the level of systemic exposure to minocycline observed in patients as a result of use of minocycline hydrochloride extended-release tablets) adversely affected spermatogenesis. Effects observed at 300 mg/kg/day included a reduced number of sperm cells per gram of epididymis, an apparent reduction in the percentage of sperm that were motile, and (at 100 and 300 mg/kg/day) increased numbers of morphologically abnormal sperm cells. Morphological abnormalities observed in sperm samples included absent heads, misshapen heads, and abnormal flagella. Limited human studies suggest that minocycline may have a deleterious effect on spermatogenesis. Minocycline hydrochloride extended-release tablets should not be used by individuals of either gender who are attempting to conceive a child. The safety and efficacy of minocycline hydrochloride extended-release tablets in the treatment of inflammatory lesions of non-nodular moderate to severe acne vulgaris was assessed in two 12-week, multi-center, randomized, double-blind, placebo-controlled trials in subjects ≥ 12 years. The mean age of subjects was 20 years and subjects were from the following racial groups: White (73%), Hispanic (13%), Black (11%), Asian/Pacific Islander (2%), and Other (2%). In two efficacy and safety trials, a total of 924 subjects with non-nodular moderate to severe acne vulgaris received minocycline hydrochloride extended-release tablets or placebo for a total of 12 weeks, according to the following dose assignments. Table 3: Clinical Studies Dosing TableSubject’s Weight(lbs. )Subject’s Weight(kg)Available Tablet Strength (mg)Actual mg/kg Dose99-13145-59451-0.76132-19960-90901.5-1200-30091-1361351.48-0.99The two primary efficacy endpoints were: 1.Mean percent change in inflammatory lesion counts from Baseline to 12 weeks. 2.Percentage of subjects with an Evaluator’s Global Severity Assessment (EGSA) of clear or almost clear at 12 weeks.Efficacy results are presented in Table 4.Table 4: Efficacy Results at Week 12Trial 1Trial 2Minocycline Hydrochloride Extended-Release Tablets(1 mg/kg)N = 300PlaceboN = 151Minocycline Hydrochloride Extended-Release Tablets(1 mg/kg)N = 315PlaceboN = 158Mean Percent Improvement in Inflammatory Lesions 43.1%31.7%45.8%30.8%No. (%) of Subjects Clear or Almost Clear on the EGSAEvaluator’s Global Severity Assessment52(17.3%)12(7.9%)50(15.9%)15(9.5%)Minocycline hydrochloride extended-release tablets did not demonstrate any effect on non-inflammatory lesions (benefit or worsening). Keep out of reach of children.Protect from light, moisture, and excessive heat.Dispense in a tight, light-resistant container as defined in the USP using a child-resistant closure. See FDA-approved patient labeling (Patient Labeling)Patients taking minocycline hydrochloride extended-release tablets should receive the following information and instructions: •Minocycline hydrochloride extended-release tablets should not be used by pregnant women or women attempting to conceive a child [see Use in Specific Populations (8.1), Nonclinical Toxicology (13.1)]. •It is recommended that minocycline hydrochloride extended-release tablets not be used by men who are attempting to father a child [see Nonclinical Toxicology (13.1)]. •Patients should be advised that pseudomembranous colitis can occur with minocycline therapy. If patients develop watery or bloody stools, they should seek medical attention. •Patients should be counseled about the possibility of hepatotoxicity. Patients should seek medical advice if they experience symptoms which can include loss of appetite, tiredness, diarrhea, skin turning yellow, bleeding easily, confusion, and sleepiness. •Patients who experience central nervous system symptoms [see Warnings and Precautions (5.5)]should be cautioned about driving vehicles or using hazardous machinery while on minocycline therapy. Patients should seek medical help for persistent headaches or blurred vision. •Concurrent use of tetracycline may render oral contraceptives less effective [see Drug Interactions (7.5)]. •Autoimmune syndromes, including drug-induced lupus-like syndrome, autoimmune hepatitis, vasculitis and serum sickness have been observed with tetracycline-class drugs, including minocycline. Symptoms may be manifested by arthralgia, fever, rash and malaise. Patients who experience such symptoms should be cautioned to stop the drug immediately and seek medical help. •Patients should be counseled about discoloration of skin, scars, teeth or gums that can arise from minocycline therapy. •Photosensitivity manifested by an exaggerated sunburn reaction has been observed in some individuals taking tetracyclines, including minocycline. Patients should minimize or avoid exposure to natural or artificial sunlight (tanning beds or UVA/B treatment) while using minocycline. If patients need to be outdoors while using minocycline, they should wear loose-fitting clothes that protect skin from sun exposure and discuss other sun protection measures with their physician. Treatment should be discontinued at the first evidence of skin erythema. •Minocycline hydrochloride extended-release tablets should be taken exactly as directed. Skipping doses or not completing the full course of therapy may decrease the effectiveness of the current treatment course and increase the likelihood that bacteria will develop resistance and will not be treatable by other antibacterial drugs in the future. •Patients should be advised to swallow minocycline hydrochloride extended-release tablets whole and not to chew, crush, or split the tablets.